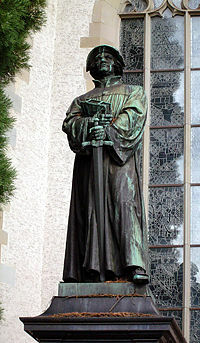 Ulrich Zwingli or Huldrych Zwingli (1484 –1531) was the leader of the Protestant Reformation in German-speaking Switzerland. 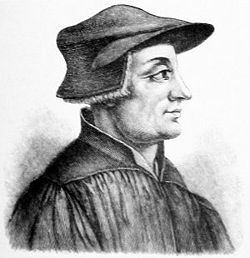 Independent from Martin Luther, who came to his understandings over the course of a long and tortuous personal struggle, Zwingli arrived at similar conclusions by studying the scriptures as a Christian humanist scholar. 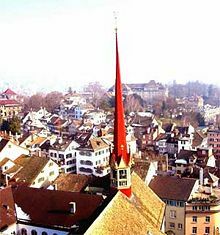 As a consequence, Zwingli took the Swiss Reformation in a decidedly different direction than Luther by insisting that scripture provided a workable model for public life, an emphasis that would be carried forward by John Calvin in Geneva. He and Luther also parted company over different interpretations of the Lord’s Supper, a breach which undermined cooperation between the German and Swiss wings of the Protestant Reformation. Zwingli aggressively attempted to extend his evangelical teachings from his base in Zürich, repressing Anabaptists and supporting a food embargo against Roman Catholic cantons which led to open hostilities. Zwingli was killed in battle at Kappel, having gone out to defend Zürich against an attack by an alliance of Swiss Catholic forces. His view on the memorial nature of the Lord's Supper influenced Baptists and the Disciples of Christ, most of whom call both baptism and the Lord’s Supper ordinances, rather than sacraments. Zwingli was born in Wildhaus, St. Gall, Switzerland to a prominent family of the middle classes. He was the third of eight sons. His father Ulrich was the chief magistrate in town, and his uncle Bartolomeus was the vicar. Zwingli displayed exceptional talent as a student and made rapid progress especially in Latin and music. He received advanced instruction in Bern, Vienna and Basel taking in due course the degrees of bachelor of arts (1504) and master of arts (1506). At this stage, Zwingli zealously pursued humanistic studies. However, at Basel, he came under the influence of Thomas Wyttenbach, a serious-minded humanist, Biblical scholar and critic of prevalent abuses in the church. Under his direction, Zwingli moved from the study of literature to a careful reading of scripture and consideration of the pastorate. In 1506, with the assistance of his uncle, Zwingli became pastor at Glarus, the chief town of a canton by that name, and worked there for ten years. Ordained by the bishop of Constance, he continued his humanist studies and perfected his Greek. He read the works of the great Dutch humanist Erasmus and was led by his writings to study the Church Fathers in their original language. Zwingli preached regularly and was conscientious about his duties as a priest. In 1516, he accepted a call to a monastery church and pilgrimage site at Einsiedeln in the canton of Schwyz. There, his bold preaching attracted notice, and two years later, he was elected “people’s priest” at the Great Minster in Zürich. Apart from his popular preaching, Zwingli distinguished himself by ministering to victims of the bubonic plague, becoming stricken himself, and recovering. A number of factors alienated Zwingli from medieval Catholicism. These included his resistance to the use of Swiss mercenaries by papal armies, his opposition to the papal doctrine of indulgences, his position on clerical marriage, and his increasing determination to apply the test of scripture to all religious observances. Unlike Luther, there is no evidence of Zwingli passing through a dark night of the soul. Nevertheless, these factors transformed his consciousness and eventually his identity as Zwingli the Christian humanist gave way to Zwingli the Protestant reformer. A patriot, Zwingli journeyed twice to Italy (1512, 1515) as a chaplain to mercenary troops from his canton in service to the papacy. However, he became profoundly disillusioned by these experiences. He witnessed his countrymen looting in victory and being butchered in defeat. Opposing mercenary traffic, he wrote a poetic fable, “The Labyrinth” (1516), which depicted Swiss sons being devoured by the legendary minotaur. Because the trade was profitable, he faced strong resistance and was pushed to leave his Glarus post. In Zürich, he renounced the papal pension he received for chaplain service in Italy. He then persuaded the town council, alone among the cantons, to resist financial offers from the French king. When Pope Leo X tried to recruit Zürichers for papal forces, he resisted just as forcefully. As a student, Zwingli heard Thomas Wyttenbach, a revered teacher, condemn the papal doctrine of indulgences. He also was affected by Erasmus’ complaint about neglect of the abounding love of Jesus by which “alone” humankind is saved. While at Einsiedeln, Zwingli preached against “pardons” purchased by pilgrims who traveled there to view the Black Madonna. However, his most vehement opposition was in response to the Franciscan monk Bernardin Samson, a papally-commissioned seller of indulgences who in 1521 appeared outside Zürich. Like the Dominican indulgence-seller John Tetzel whom Luther opposed, Samson was given to extravagant claims. Zwingli denounced such sellers as emissaries of Satan and convinced the town magistrates to forbid his entrance. Zwingli had an acknowledged weakness with respect to his vow of clerical celibacy. When applying for the appointment of “people’s priest” at the Great Minster, he penned a statement which admitted that he had given in to the “blandishments” of a woman but that he was aware of his weakness and was not further entangled. Later, he reversed field, criticizing clerical celibacy and joining with ten other evangelical priests in an appeal to the bishop of Constance calling on him to allow clerical marriage. The bishop was not inclined to grant this request, in part because he and others enjoyed substantial income generated from fines imposed on priests with concubines and children. In 1522, Zwingli secretly married Anna Reinherd, a widow of nine years with a good reputation. He publicly married her in 1524 and between 1526-1530, the couple had four children. While his positions on mercenary soldiers, indulgence-sellers and clerical celibacy alienated him, they did not induce Zwingli to sever ties with the Roman church. Numerous others lived with this sort of cognitive dissonance and ambiguity. What accelerated matters and finally drove Zwingli to stances that were irreconcilable with the church was his determination to apply the test of scripture to all religious observances. As an early admirer of Erasmus, Zwingli hand-copied the Dutch humanist’s 1516 Greek New Testament and committed substantial portions to memory. His strict reading of scripture led him to dismiss ascetic orders, the invocation of saints and the doctrine of purgatory in his sermons at the Great Minster. He also came to the conclusion that church-mandated fasts, such as the prohibition of meat during Lent or on Friday, were unscriptural and, therefore, not binding. Zwingli’s conclusion on this topic, more than any other, launched the Swiss Reformation. Pressing his position that scripture be the norm of doctrine and worship, Zwingli called for a public disputation before Zürich’s governing authorities on issues he had raised. The town council scheduled a public disputation for January 23, 1523, to which the bishop of Constance or his chosen deputies were invited. Zwingli prepared Sixty-Seven Articles for debate, which was his first systematic statement of his views. He affirmed Christ as the sole head of the church, salvation by faith alone, and that Christians were free with regard to works not mandated by scripture. He repudiated the authority of the pope, transubstantiation and the sacrificial character of the mass, worship of saints, purgatory, fasts, monastic vows, and pilgrimages. At the disputation, attended by six hundred clergy and citizens, the bishop of Constance’s representatives refused to debate, stating that these were not fit matters for a town council to discuss and that a future church council would address them. Zwingli maintained that the Christian community as a whole, not a council of bishops, was under the direct lordship of Christ and fairly represented by duly constituted civil authorities. In the absence of arguments against his conclusions, the town council declared Zwingli the winner, authorized him to continue his work and declared that all others in the canton should follow the scriptures in their preaching. This action effectively severed Zurich from the jurisdiction of the bishop of Constance and committed it to the evangelical camp. Zwingli’s triumph—and, in particular, his “negative scripture test,” under which practices that were not positively authorized by scripture should be rejected—led to the destruction of crucifixes and images in several Zurich churches. This precipitated a second public disputation, convened on October 26, 1523, for the purpose of establishing a policy on images and the Latin Mass. This meeting, attended by nine hundred clergy and citizens, was another victory for Zwingli, but the council acted more cautiously. Although it accepted Zwingli’s theological understanding that the Eucharist was not a re-enactment of Christ’s sacrifice but a remembrance of his sacrifice, it retained the Latin Mass and authorized only the removal of privately-owned images from churches. However, it appointed a committee of fourteen, including Zwingli, to plan and oversee specific steps of reform. Zwingli, in fact, favored the “gradualist” policy and believed it was the best way to achieve his ends. He wrote A Short Christian Introduction to guide the committee and in the course of the next several years succeeded in arranging the orderly removal of images from the churches and having the Latin Mass replaced by a simple form for the administration of the Eucharist which he wrote. Although an accomplished musician, Zwingli came to the conclusion that the Bible excluded instrumental music for public worship. Pipe organs were removed, or in the case of the Great Minster, walled-up. Zwingli expounded on all of these matters in a theological treatise, The Commentary on True and False Religion. Zwingli’s reform program hit an unanticipated snag in the rise of the Anabaptists after 1525. At odds with Zwingli for his cooperation with the town council and for what they regarded as his failure to apply the Biblical test to all religious practices, radical reformers first became visible during the second Zurich disputation. Led by Conrad Grebel (1498-1526) and Felix Manz (1500-1527), they called for the immediate destruction of images and suppression of the mass. They denied that the church comprised all members of the community, as Zwingli taught, proposing instead a separatist church of the regenerate. They rejected all state intrusion upon Christ’s church, opposed the collection of tithes and eventually became identified with their denial of infant baptism. Some interrupted church services and attempted to take over pulpits. The Anabaptists put Zwingli in an awkward position. Though disagreeing with their separatism, he had questioned whether infant baptism was indicated in the New Testament and denied the scriptural basis of tithes. Therefore, he and the town magistrates tried to be patient. However, in January 1525, town officials adopted a measure which compelled parents to baptize infants within eight days of birth and which forbid separatist meetings and unauthorized preaching. In response, on January 21, the dissidents began the practice of re-baptizing adult believers. The following week they held revival meetings. This brought matters to a head, and their leaders were arrested. Two subsequent conferences failed to resolve the dispute, and on March 7, 1526, the Zürich town council decreed re-baptism a capital offense, punishable by drowning. By this time, it was apparent that most Anabaptists opposed military service and participation in government. Therefore, they were perceived to be a civic as well as a religious threat. On January 5, 1527, Manz was drowned, the first of innumerable Anabaptist martyrs. Ironically, Zwingli was put in the position of suppressing the very freedom to interpret scripture that he had championed. However, in this regard, he was a realist. He never believed that his reform program would be accomplished by preaching or religious persuasion alone. It required the cooperation and, if necessary, coercive authority of magistrates. Zwingli rejected Anabaptist counsels of perfection and a church “without sin.” Seemingly at odds with his biblicism, he buttressed defense of infant baptism on the arguments of Church Fathers since a clear scriptural position was not apparent and based the payment of tithes not on scripture but as a practical necessity. Zwingli’s difficulty in maintaining fellowship with those who affirmed the sole authority of the Bible but differed as to specific interpretations typified the age and undermined reform efforts among the Swiss. Whereas Zwingli opposed radical Anabaptists on a host of theological issues and practices, he broke ranks with Luther over his teachings on the Eucharist. Zwingli taught that the Lord’s Supper was a common meal of thanksgiving and remembrance. In this, he repudiated the Roman Catholic doctrine of transubstantiation which held that the elements of communion, once consecrated, ceased to be bread and wine, and became instead the body and blood of Christ. Zwingli denied Christ’s bodily presence, arguing that he was present only spiritually in the hearts of believers. He argued that the proper interpretation of I Corinthians 11:24 (“This is my body”) was “This signifies my body.” He also maintained that a physical body cannot be in more than one place and that Christ’s body, since the Ascension, was at the right hand of the Father. For Luther, Zwingli’s doctrine amounted to a denial of the incarnation. To him, Christ inherited all the qualities of divinity, including omnipresence. Therefore, he could be present, bodily, on ten-thousand altars at once. Holding to the “simple meaning” of Christ’s words, “This is my body,” Luther did not assert the miracle of transubstantiation but maintained Christ’s “real” presence “in, with, and under” the consecrated elements. In 1527, Zwingli opposed Luther’s position in a pamphlet entitled “Friendly Exigesis, or Exposition of the Eucharist.” The next year Luther penned his Great Confession Concerning the Holy Eucharist, an angry tract which attacked Zwingli in customary polemical style, denouncing the Swiss reformer and his followers as “fanatics” and questioning their Christian identity. Their final rupture occurred at the Marburg Colloquy (1529), called by Phillip of Hesse, a prominent Lutheran prince, for the purpose of uniting the German and Swiss wings of the Reformation. Luther, who with difficulty had been prevailed upon by Hesse to attend, began the first common session by pulling back the velvet tablecloth and writing on the table, “Hoc est corpus meum” (“This is my body”). Although they found an unexpected harmony in other respects, no agreement could be reached regarding the Eucharist. In the end, Luther refused to call his Swiss opponents brethren, even while he wished them peace and love. Luther’s famous phrase, “You have a different spirit than we,” although not addressed to Zwingli but to one of his supporters, correctly summarized matters. The impasse shattered Phillip of Hesse’s dream of a Protestant league and permanently divided the Lutheran and Swiss reformers though Zwingli’s views found adherents in southwest Germany. Nevertheless, the Reformation proceeded apace in other cantons in cites, often with Zwingli’s direct or indirect assistance. Bern, Switzerland’s largest canton, was won to the reformed side in 1528 after a lengthy public disputation in which Zwingli played a leading part. It subsequently joined Zürich and the city of Constance, already won to the reformed cause, in the Christian Civic Alliance. The following year, St. Gall, Biel, Mulhausen, Basel and Schaffhausen joined the alliance. The Catholic cantons formed a rival Christian Union, going so far as to form an alliance with Austria, Switzerland’s ancient enemy. Despite escalating tensions, Zürich pursued an aggressive policy, sending evangelists into opposing cantons. One of them, Jacob Kaiser, was arrested in Schwyz and burned at the stake on May 29, 1529. This incident led to open hostilities. Zürich declared war on the Christian Union, and forces from both sides confronted one another at Kappel near Zürich. Largely because Austria did not offer assistance, the Catholic cantons were forced to sue for terms favorable to Zürich. These included the freedom to preach and compensation for Kaiser’s family. The Christian Union also agreed to repudiate its alliance with Austria. Although Zürich emerged victorious and assumed political leadership of the evangelical cause, Zwingli recognized that the Peace of Kappel was only a truce and argued, in vain, for his canton and others to prepare for war. Unwilling to fight, the Christian Civic Alliance accepted Bern’s proposal to impose a food embargo on the Catholic cantons. This led to renewed hostilities. Assured of aid by the pope, the Catholic cantons rapidly mobilized and attacked the canton of Zürich on October 6, 1531. Outnumbered and unprepared, the Zürich forces were defeated at the Battle of Kappel on October 11. Zwingli, who rode out with the troops as a chaplain, was discovered among the severely wounded, slain, his body quartered, burned and mixed with dung. Zwingli was the central figure of the Protestant Reformation in German-speaking Switzerland. Though respectful of Luther, he always maintained that he came to his evangelical position independent of the German reformer. While there is no historical basis to prove or disprove this assertion, Zwingli clearly added emphases which separated his work and the Swiss Reformation from the German Lutherans. Chief among these were his “negative scripture test,” i.e. that religious practices not possessing a positive warrant in scripture should not be permitted, and his insistence that scripture provided the foundation for civic governance. These emphases were carried forth by John Calvin in French-speaking Switzerland and played a decisive role in shaping Calvinist churches and societies in Europe and North America. Though sometimes overlooked, likely due to his premature death, Zwingli was a reformer of the first rank and a bridge between Luther’s emphasis on the justification of individual believers and Calvin’s interest in the sanctification of society. Zwingli, Ulrich. The Latin Works and the Correspondence of Huldreich Zwingli, Together with Selections from his German Works. Edited, with introductions and notes, by Samuel Macauley Jackson. Translated by Henry Preble, Walter Lichtenstein, and Lawrence A. McLouth. New York: G. P. Putnam & Sons, 1912. This article began as an original work prepared for New World Encyclopedia by Mike Mickler and is provided to the public according to the terms of the New World Encyclopedia:Creative Commons CC-by-sa 3.0 License (CC-by-sa), which may be used and disseminated with proper attribution. Any changes made to the original text since then create a derivative work which is also CC-by-sa licensed. To cite this article click here for a list of acceptable citing formats. This page was last modified on 23 November 2009, at 17:07.